Men, we have fought through the war together. I have done the best that I could for you. Gen. Robert E. Lee spoke those words when he returned to his men, from the home of Wilmer McLean, where on this morning he surrendered his Army of Northern Virginia to Ulysses Grant. Officially our nation's bloody, internecine conflict was over. 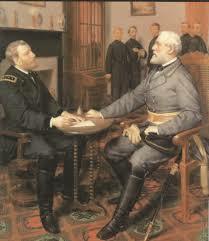 Lee's troops were paroled by Grant. When Lee asked for help feeding his nearly starving men, Grant responded with generosity, using the food that the men of George Armstrong Custer had seized on a train before Lee's men could get there. Allow me to offer a few reflections on Appomattox Court House, the site of both the final battle early that morning, and of Lee's surrender. I think there are lessons that are relevant today.